Just before 8pm this evening Sonisphere announced their three headliners and a number of other bands who would be performing at the 2012 edition of the UK festival. The poster and announcement for the festival stated that Kiss would be supported by special guests and we would be informed who in a future announcement but Faith No More have jumped the gun. 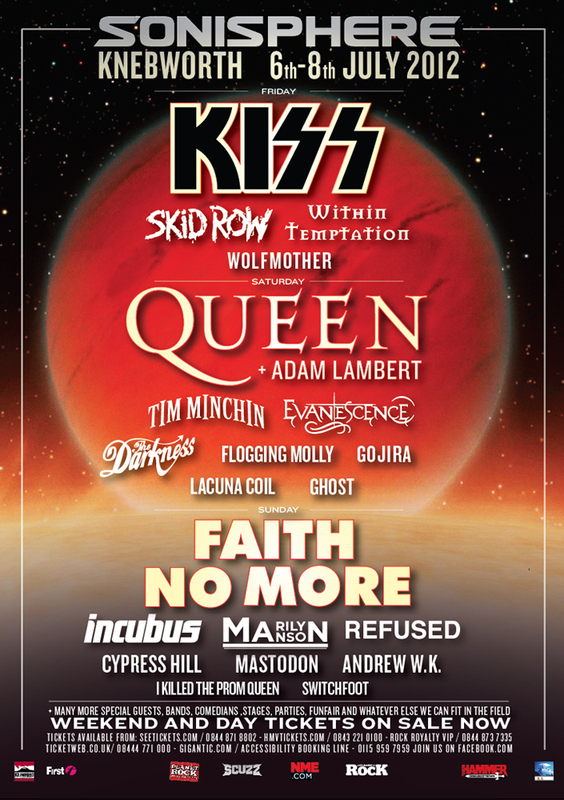 Faith No More, who will close the festival on the Sunday, uploaded a similar poster to that on the Sonisphere website but with one notable exception, they have revealed that Skid Row will be the special guests to Kiss. With the addition of Skid Row, the full line-up for the festival now includes Queen with Adam Lambert, Kiss, Faith No More, Refused, Within Temptation, Wolfmother, Evanescence, The Darkness, Flogging Molly, Lacuna Coil, Fields Of The Nephilim, Gojira, Katatonia, Ghost, Incubus, Marilyn Manson, Mastodon (performing their latest album ‘The Hunter’ in full), Cypress Hill, The Blackout, Andrew W.K., Switchfoot and I Kill The Prom Queen.